In the last lesson we learned how the most simple form of audience manipulation is for an author to tell a tale, such as a fairy tale or cautionary tale in which a statement is made that a particular path is good or bad. But, how much power would an author have if he could convince his audience that his favored path is not just good or bad, but is, in fact, the best (or worst) of all possible approaches that might reasonably be taken in the situation under study. In that case, the author is not just changing behavior, but changing minds as well. Naturally, audience members (readers) are not going to just accept such a blanket statement without some proof. In fact, for the earliest storytellers around the campfire, blanket statements would be met with rebuttals from his listeners who would ask, "What about this other approach you didn't mention? Why isn't that a better way?" Being right there, the "author" could attempt to counter that rebuttal by explaining why that other option wouldn't be as good. If he made a successful case, the objection would be dropped. There might be several alternatives brought up by the audience, but if they were all addressed, the author's original blanket statement would be generally accepted as true. But once stories began to be recorded in song and manuscript and presented to audiences where the author was not present, there would be no way to counter the rebuttals. And so, in order to successfully support a blanket statement, authors started to include in the tale itself explanations about why the other major reasonable alternatives were not as good as the proffered one. It was this action that elevated the tale (a statement) to become a story (an argument) as we know it today. The collection of necessary supporting arguments required to prove a blanket statement became embedded in the conventions of story structure audiences expect around the world. Interestingly, these conventions describe all the different ways of reasonably looking at a problem - the full complement of perspectives each of us employs every day when trying to understand difficulties and seek solutions. So, in a sense, the structure of stories ultimately evolved from a single perspective to a living, dynamic model of our problem-solving processes - perhaps of our minds themselves. 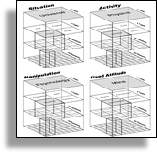 And even more interestingly, the processes we described in our first two lessons of storytellers trying to accurately document human behavior of individuals in in relationships converge with this model of the mind borne of seeking to support blanket statements. To recall, when people come together in groups for a common purpose, the begin to specialize insofar as one member emerges as the voice of reason for the group and another as the skeptic, for example. In time, the group self-organizes without any conscious intent of its members until the complete collection of specialities is identical to the full complement of perspectives every individual uses in his or her own life. In other words, the group becomes a group mind, structurally, in which each specialist represents (and functions as) one of the facets of any individual mind. And, in this way, more depth and detail can be discovered by the group in regard to its issue of common concern than if all its members came to the table as general practitioners, trying to solve the problem in all areas at once. And so, the attempt by thousands of years of storytellers to accurately represent human behavior and the attempt of authors to manipulate audiences through arguments both converge on the same model of the fundamental approaches to problem solving that illuminate the very mechanisms of our individual minds.